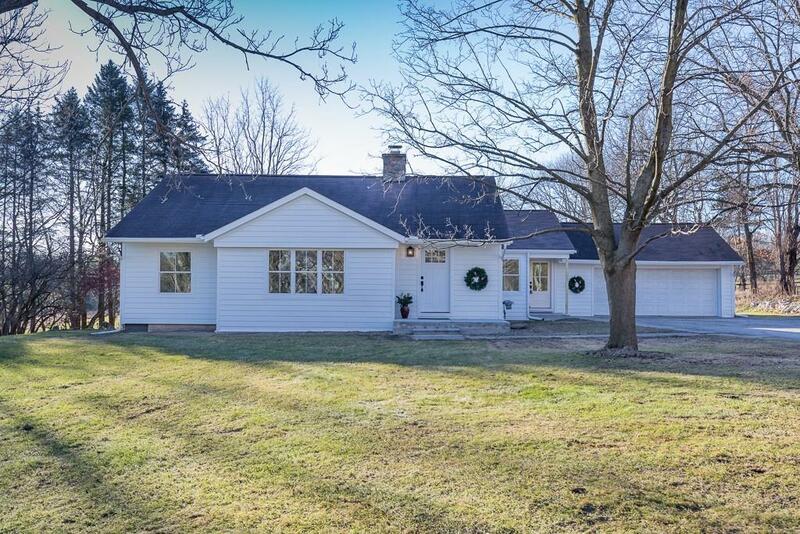 Completely renovated gorgeous farmhouse on 2.4 acres with picturesque views in award-winning Rochester School District. Single level living with plenty of room to expand. One mile from Country Creek Commons and Gallagher Creek Park on Billion Dollar Mile with finishes chosen with the intention to live in as a forever home - no flip quality here! Open concept living/dining/kitchen. Large windows and vaulted ceilings. Mudroom and breakfast nook. All new Marvin windows and James Hardie siding; Entirely new kitchen with Dillman Upton DuraSupreme cabinets; Quartz countertops; Rohl sink; Brizo faucet; Kitchenaid appliances; Pottery Barn/Williams Sonoma light fixtures throughout; New 96% efficiency furnace and AC unit; New Iron Filter; Site-Finished White Oak Floors; the list goes on. Charming red barn that could serve live stock or fun gatherings. The perfect opportunity for privacy in the middle of it all. This stunning home is a rare find! Delta Kelly, Van Hoosen & Adams H.S... BATVAI.